Wednesday, May 27, 2009, 7 p.m.
Public consultations were being held across Saskatchewan, May 26 - July 31, 2009, to hear responses to Capturing the Full Potential of the Uranium Value Chain in Saskatchewan, a provincial government report which recommends the construction of a Saskatchewan nuclear reactor and supports the burial of nuclear waste in that province. For more information, go here. Underground Parking. Stadium Skytrain station. Free, public events. Vanier College is at 821 avenue Sainte-Croix, Saint-Laurent, PQ. Click on the posters above for full-size versions. Monday, March 23, 2009, 7:30 p.m.
Is organic food better for you and for the environment? Are GMO's part of the problem or part of the solution? 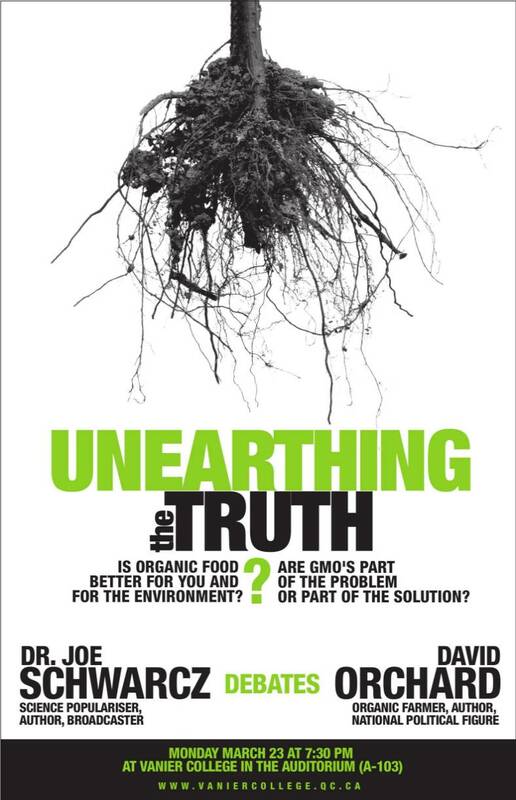 Dr. Joe Schwarcz is a well known science populariser, author, broadcaster. David Orchard is an organic farmer, author, national political figure. 8:30 a.m. Lili Petrovic, "The decriminalization of agression"
The U.S. Democratic presidential nomination race has put the North American Free Trade Agreement (NAFTA) back into the political discourse with both Barrack Obama and Hilary Clinton promising to renegotiate the agreement, if elected president. What is NAFTA? If it's true that Americans are unhappy with it, what about Canadians? Is this "trade agreement" good for Canada, as our government is telling us? What are the critics saying? Is NAFTA forcing Canada into closer integration with the U.S. and what does that mean? Next week in Vancouver (May 14-15), The Ridge is screening Hoodwinked: the Myth of Free Trade, a film by Canadian film makers Bill Dunn and Linda West, that attempts to answer those questions and more. Using seldom seen archival material the film presents Canada's 400-year history and examines the relationship with its powerful neighbour leading up to the signing of the Canada-U.S. Free Trade Agreement (FTA) in 1989 and NAFTA in 1993. The film is narrated by historian and former Senator Laurier Lapierre and explores the issues raised by the agreements in interviews with former Prime Minister John Turner; sociologist Peter Urmetzer; Canada Research Chair for Social Justice and critic of neo-conservatism Shadia Drury; political economist and author Stephen Clarkson; economist Jim Stanford; David Orchard, farmer, politician and author of The Fight for Canada — Four Centuries of Resistance to American Expansionism; and the late Dalton Camp, writer and former strategist for the Progressive Conservative Party. This film is an excellent introduction to what "free trade" with the U.S. means for Canada — please pass the word! Tuesday, April 18, 2008 1 p.m.
"Renewable energy, sustainable resources, and trade"
Thursday, April 10, 2008 7:00 p.m.
Public forum on Kosovo's unilateral declaration of independence: "The New World Order — International Law Need Not Apply"
"The United Nations incorporated the principles of territorial integrity and state sovereignty into the United Nations Charter. The Helsinki Final Act of 1975 reinforced the U.N. declaration by adding to them the principle of the inviolability of borders. These are fundamental principles with universal application. They cannot be set aside because of special cases or because they present an obstacle to the policy objectives of economically powerful nations." To hear David Orchard's remarks on Kosovo's unilateral declaration of separation made at a demonstration in Toronto, March 1, 2008 go here. To read his articles on the NATO/U.S. 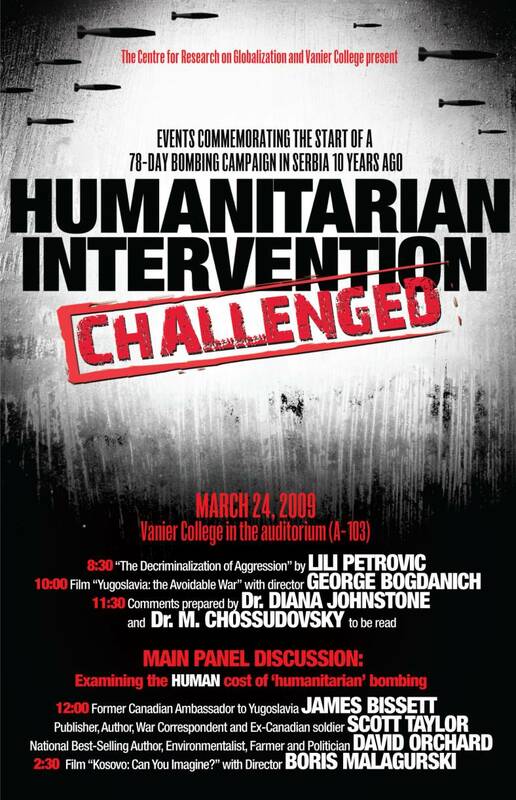 bombing of Yugoslavia in 1999 go to "Canada at War", "Humanitarian bombing" and "Globalism's first victim." Sunday, March 30, 2008, 12:44 p.m.
David Orchard is speaking along with author and economist Michel Chossudovsky and Québec-Serbian novelist and playwright Negovan Rajic. Statements of support will be read from General Lewis Mackenzie; Canada's former ambassador to Yugoslavia, James Bissett; author and professor of criminal law, Michael Mandel; and City University, New York City, professor of European history, Barry Lituchy. To read his articles on the NATO/U.S. bombing of Yugoslavia in 1999 go to "Canada at War", "Humanitarian bombing" and "Globalism's first victim." "Making Canada Inclusive and Safe"
Sunday, November 25, 2007, 11 a.m.
"Roles and Responsibilities in Making Canada Inclusive and Safe." 1070 AM on the dial in Victoria and southern Vancouver Island, or listen live on-line. Sunday, July 1, 2007, 2 p.m.
6540 Thomas Street, Burnaby, B.C. David Orchard will be in Vancouver on Canada Day, July 1, 2007 to meet with friends and supporters and celebrate the day with a salmon barbecue at the Scandinavian Cultural Centre in Burnaby. All are welcome to attend this now traditional David Orchard event in Vancouver, to meet with and hear David speak on the issues facing Canada today, and celebrate our country with some west coast wild salmon and home cooked food. Tickets for the barbecue are $20 (children under 12 are free). To reserve, please call or e-mail Rose-Marie Larsson at tel 604-215-5580, rlarsson@telus.net or purchase with a credit card here. Screening of "Hoodwinked: the Myth of Free Trade"
More dates are in the works — please check back for details! David Orchard, guest speaker: "Why is Canada in Afghanistan?" David Orchard speaks on "Illegal Wars, Illegal Weapons: Vietnam to Afghanistan"
David Orchard presents to the Saskatchewan Legislative Assembly's Standing Committee on the Economy hearing on the Agreement on Internal Trade (AIT) and the Trade, Investment and Labour Mobility Agreement (TILMA). This is a public event open to all, part of two weeks of public hearings held in Regina, June 4-8, 2007, and Saskatoon, June 11-15, 2007. For more information, a list of speakers and to listen live go here (click on "listen live"). Previous hearings – and tomorrow's after its conclusion – are available here. Speech by David Orchard to local farmers and residents at the invitation of Heather Carter, federal Liberal Candidate for Niagara West-Glanbrook. 11 a.m. Press conference with former federal Agriculture Minister, The Hon. Ralph Ferguson, Tim Fugard, federal Liberal Candidate for Sarnia-Lambton, and David Orchard on the threat to supply management and the imports into Canada of untested, inadequately and misleadingly labelled food products; held at the farm home of Ralph and Dolores Ferguson, Sarnia. 12 noon - 6 p.m. Tour of Sarnia-Lambton with Tim Fugard: visit to local farms, including a stop by the Orchard ancestral 1870 homestead; tour of the Sarnia oil refinery district; visit to the Sarnia Occupational Health Clinic for Ontario Workers (OHCOW) and meeting with Executive Director, Dr. James Brophy and Dr. Jim Mackenzie regarding the alarming cancer rates in the Sarnia-Lambton area. 6 p.m. Dinnerwith David Orchardas guest speaker, the Brigantine Restaurant, Sarnia. Sponsored by Tim Fugard, federal Liberal Candidate for Sarnia-Lambton. In his first major public meeting in Saskatoon since winning the leadership of the Liberal Party of Canada Stéphane Dion will reply to Stephen Harper's ongoing attack on prairie farmers and the Canadian Wheat Board (CWB). The Canadian Wheat Board was introduced by a Conservative government, that of R.B. Bennett, in response to farmers' demands for an end to exploitation by the large grain companies. The CWB is one of Canada's largest earners of foreign currency and has a reputation as the world's most prestigious marketing board. This international respect puts dollars in western pockets. If the Wheat Board is destroyed, as the Harper government intends, control of Canadian grain marketing will quickly move from the hands of Canadian farmers to those of the giant American grain companies. The east-west transportation links, built by Canadians, and the big grain terminals in ports from Prince Rupert to Quebec City, including Churchill, our only prairie seaport, will be crippled. The direct out of pocket cost to western farmers will be hundreds of millions of dollars each year. Don't miss this chance to hear Stéphane Dion take on Stephen Harper on behalf of the west. Bring your friends, one and all! $10 (fully waged) or $5 (students, seniors, low income). Bring your own lunch. Co-sponsored by Saskatoon Peace Coalition; United Nations Association of Canada – Saskatoon; St. Thomas More College Campus Ministry, and Citizens Concerned About Free Trade. For more information please call 306-653-5636 or 306-664-8443. "Future directions for Canada and the Liberal Party"
All welcome. To reserve tickets, $20, please call Louise Mitchell at tel 905-935-2885. Sunday, June 4, 2006 1:30 p.m.
2110 Burrard St. Vancouver, B.C. The Fight for Canada – Four Centuries of Resistance to American Expansionism, and the late Dalton Camp, writer and former strategist for the PC Party. way, resist Americanization, and remain strong in the face of neo-conservative ideology. Screenings of Hoodwinked with David Orchard as guest speaker are being planned for cities across Canada – watch this page for soon-to-be-announced dates! The Guelph Public Forum: "Organic food and energy challenges... the next 25 years"